This is my lighter, brighter version of classic pea and ham soup, and it's made quickly, with minimal boiling, in order to preserve some of the fresh colour of the peas. Because I love the contrast of hot and cold, and to add sparkle to the soup, I've topped it with a cool mixture of thick Greek yoghurt, mint, lemon and Tabasco sauce, and a ripple of fruity olive oil. When everything's swirled together in a bowl, the contrasts in flavour and temperature are most satisfying. Frozen peas are essential for this dish (I never use anything other than frozen peas, because their taste and texture is so superior to raw peas that've been sitting on a supermarket shelf for days). Do try to find white pepper to use in this soup: it makes a small but appreciable difference to the flavour of both soup and topping. The cornflour in the soup is there is help bind everything together. The first time I made this soup, it kept separating, but the addition of cornflour in the next batch sorted out that problem. With peas cooked for such a short time, you won't achieve a perfectly smooth purée, but I like a soup with a bit of texture. First make the topping. Put the yoghurt, lemon zest and juice, Tabasco sauce and mint into a bowl and stir well. Season with salt and a little white pepper. Refrigerate. Put the frozen peas in a large bowl and pour half the boiling water or stock over them. Stir gently to break up any icy lumps and set aside. Cut the gammon steaks into small cubes. Heat the oil in a large pot and add the gammon. Fry over a high flame, stirring often, until the cubes are nicely browned. Now add the juice of a lemon (stand back, as there will be spitting) and stir vigorously to loosen the brown sediment on the bottom of the pan. Cook for a further 30 seconds. Remove the gammon with a slotted spoon and set aside. Add the onion to the pan (you may need to add a little more olive oil) and fry gently for a few minutes, or until soft and translucent. Stir in the garlic and cook for another minute. Return the soup to the pot along with the gammon cubes (but set aside a few cubes to use as a topping). Reheat, using a spoon to skim off any foam on the surface. Simmer for four minutes; any longer and the soup will begin to lose its colour. Turn off the heat and stir in the cream and big squeeze of lemon juice. Don't reheat the soup at this point, as it may curdle. Season with more salt, if necessary, and a pinch of white pepper. 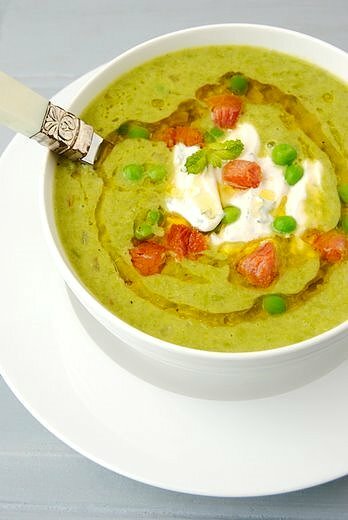 Serve piping hot, topped with a big blob of minty yoghurt, the reserved peas and gammon cubes, and a generous swirl of fruity olive oil. Lovely light touch with that old favourite - nothing like the boil-it-up-forever-with-ham-hocks of my Austrian aunts. This one's going straight into the evernote Try Next folder. Most of the health food shops in CT stock arrowroot,as a possible alternative to cornflour. Same silky texture and neutral taste, but doesn't separate as easily during reheating and freezing. Sounds delicious...I'm such a fan of pea soup, I must try this one...only (stupid)question...could you elaborate on 'fruity olive oil'? Hmm what a great recipe, it looks so delicious so i think i will give it a try. Until that i want to thank you for sharing it with us. Thanks Steve. I love old-fashioned pea and ham soup but I always feel as if I'm slowly inflating it as I eat. And you really don't want any the next day. I have arrowroot in my spice stash, and will give it a try with this soup. Meisie: thanks for the comment. By 'fruity' I mean an olive oil that has a lovely round fruity taste, not a thin or acidic taste. Made this today. It was delicious. Will definitely be making it again.